It’s a hard job but someone had to find the best gin and tapas in Madrid. 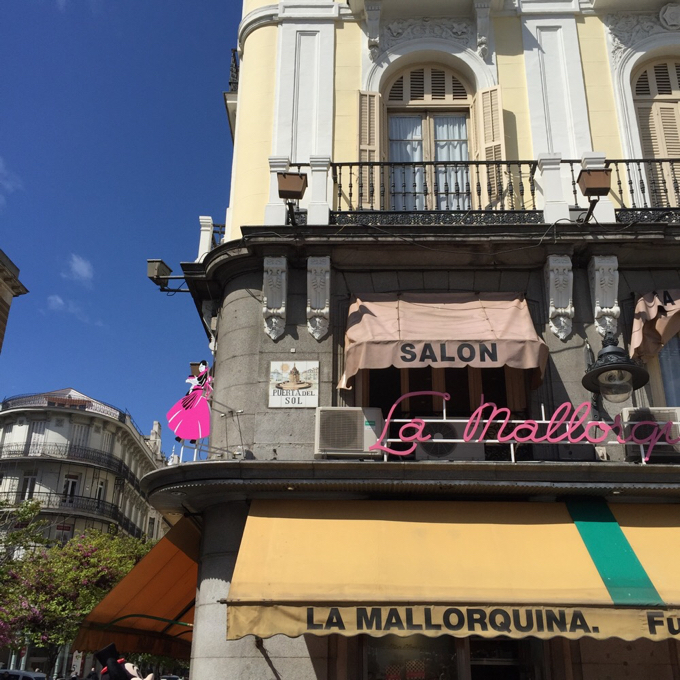 Penny ventured out of the country without kids once more, to help a good friend celebrate her 40th birthday in style in Spain’s capital, a foodie, shopping and gin lover’s paradise city. 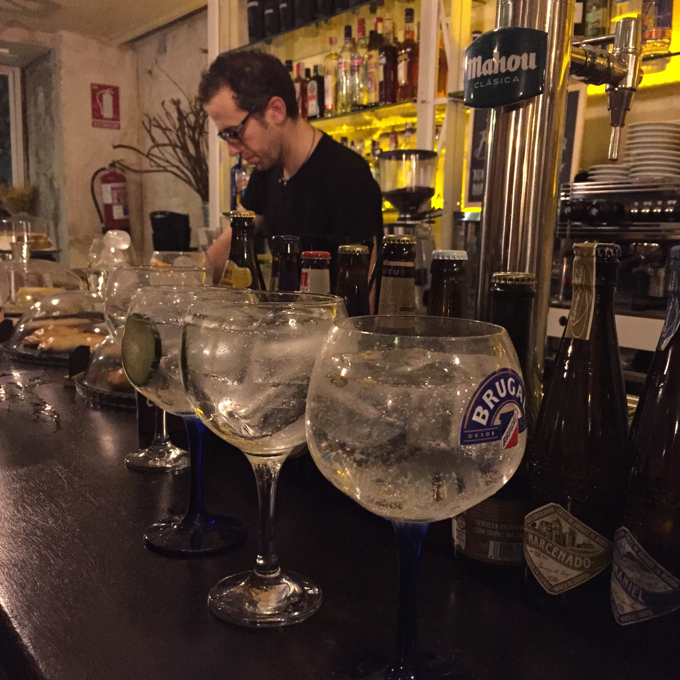 I anticipated eating lots of tapas, but had no idea gin would be such a big thing in Madrid, I have since learnt Spain is the largest gin market in the EU and third largest in the world. The super-premium gin sector is booming here; evident in some amazing gin bars with huge goldfish bowls of gin which we were immediately drawn to on arriving in our first bar. 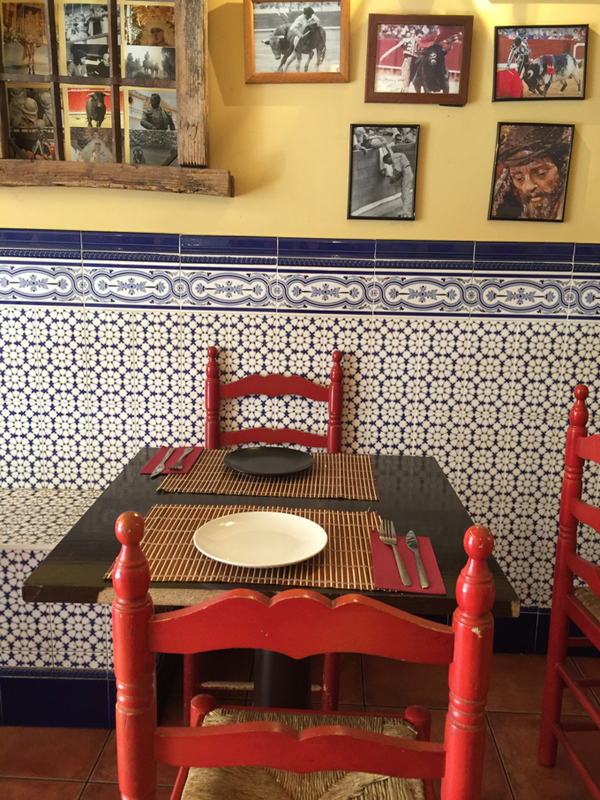 Calle de Ponzano in the Camberi district is a brilliant mix of new and more traditional bars, all serving a fantastic range of foods to an older crowd, so absolutely perfect for mums on the run. You can pick up a guide and map of all the eateries in the area or simply follow your nose as we did. 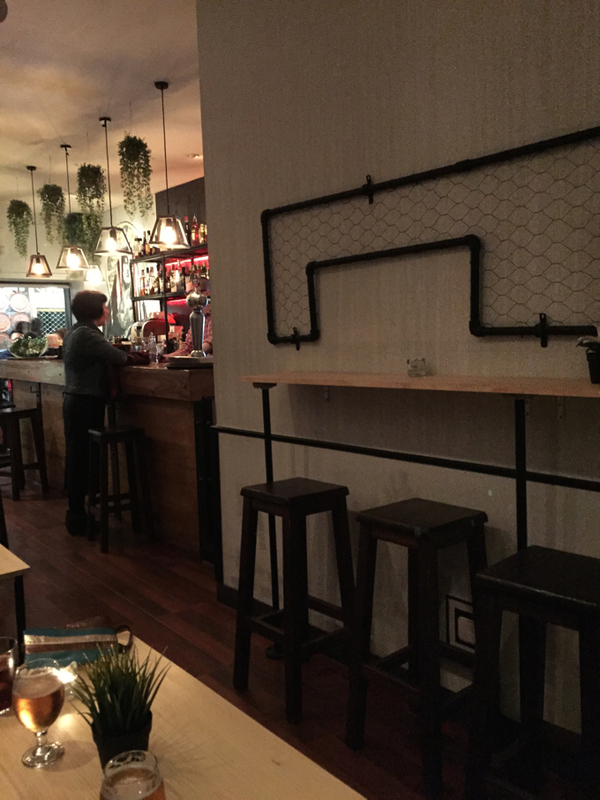 Our first stop had an industrial feel with exposed brickwork, hexagonal tiles, a bike hung on the wall and the clientele perched on bar stools made from old pipes. On a Friday night the mood was lively, with music and post work chatter. The tortilla was among the best we tasted in Madrid. I failed to take photos in this area, instead one of Madrid’s many industrial styled bars! We finished the night in a more traditional and quieter taverna, it felt much more like you might imagine Spain to be, but it was still standing room only. It was a lovely mix of groups of laughing friends and kissing couples, old and young. 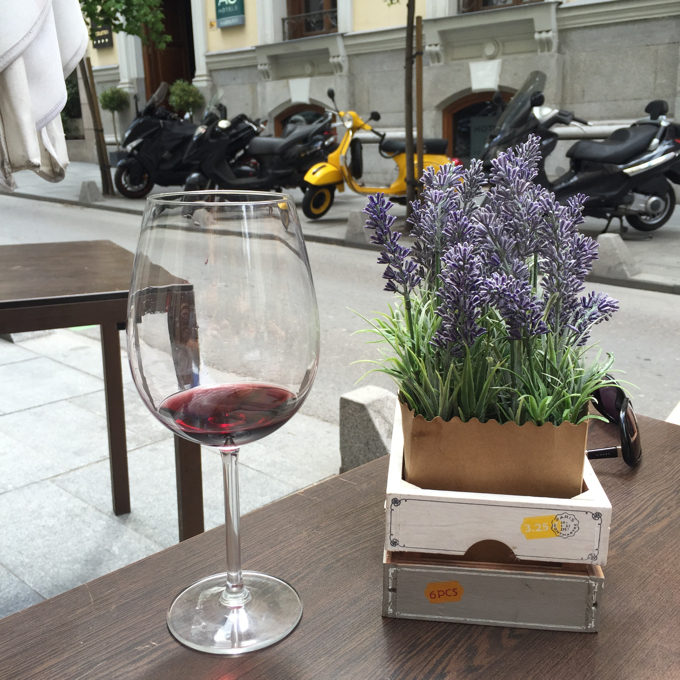 Madrid would also be an excellent place for a romantic child-free getaway. 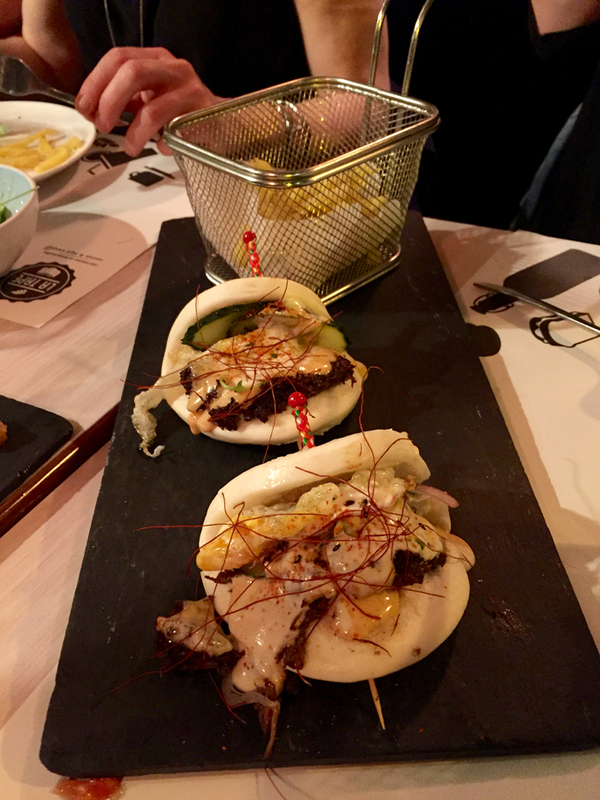 After eating in several traditional Spanish restaurants it was fun to encounter La Tape, where Asian inspired fish dishes meet Mediterranean hummus and more traditional Spanish tapas, it was a fabulous journey round the world at our table. 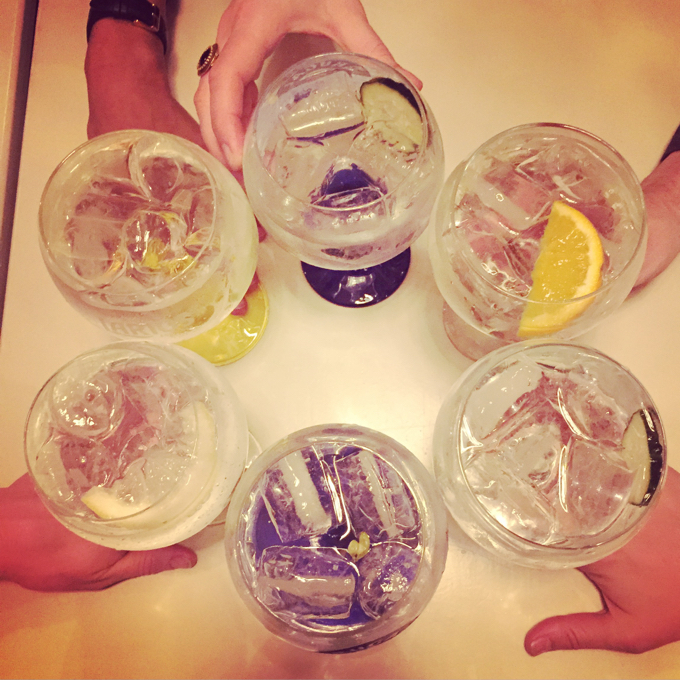 Spain is the biggest importer of gin, so there are plenty of opportunities to taste a wide variety of the world’s best. 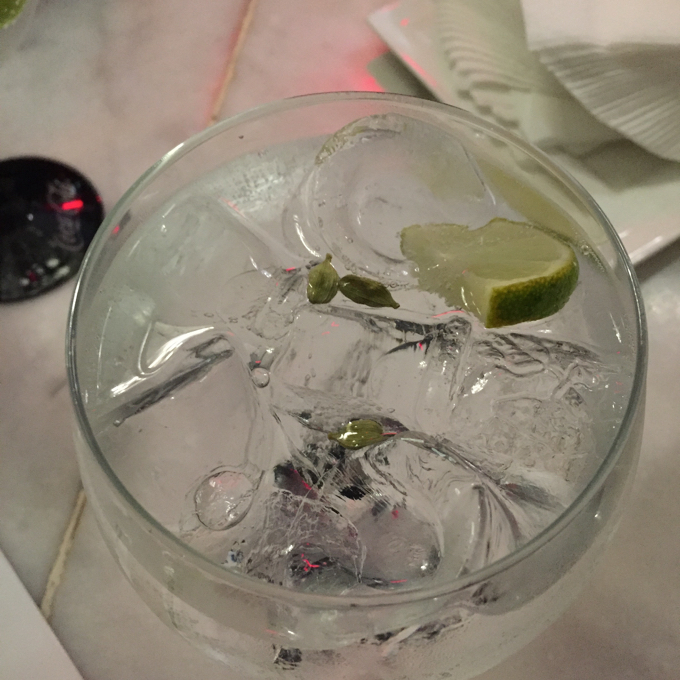 After dinner at La Tape, we headed over the road to a gin bar which had ’50 of the best gins’ in the world – that dear reader, is how you will recognise it, because while I thought I was taking a photo of bar’s name, the sign was actually just the bar’s USP. The huge bauble shaped glasses, finished with bespoke adornments to bring out the flavour of the botanicals in your choice of gin – cardamom, lemon peel, cucumber – were a sight to behold. I recommend the Micronesian with a twist of lime and angelica root. Every drink in Madrid was served with nibbles, as is customary in the continent, but I have never seen jelly sweets served. They make the gin a novel experience. We continued on past side streets lined with absolutely stunning bars, picking the odd one to drink in, we resorted to choosing the next gin by the look of the bottle as our Spanish and premium gin knowledge was pretty basic. It worked though! 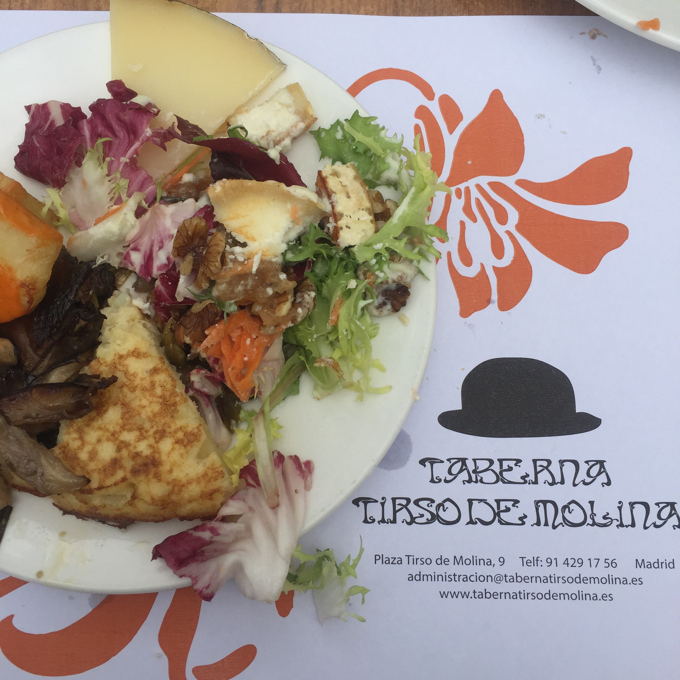 Las Musas hostel was close to the flower filled Plaza Tirso de Molina, so the first and last place where we utterly feasted on Spanish food was Taverna Tirso De Molina. So good we had to go back twice! The inside is deceptive, stained glass windows give a beautiful burst of colour, while underneath them booth like seating runs along the bar further than the eye can see. After a night out we needed a few pit stops to get round some of the main sights. It’s a short wander to Plaza Mayor where you can enjoy a coffee at tourist prices and watch the world go by – sometimes this has to be done. 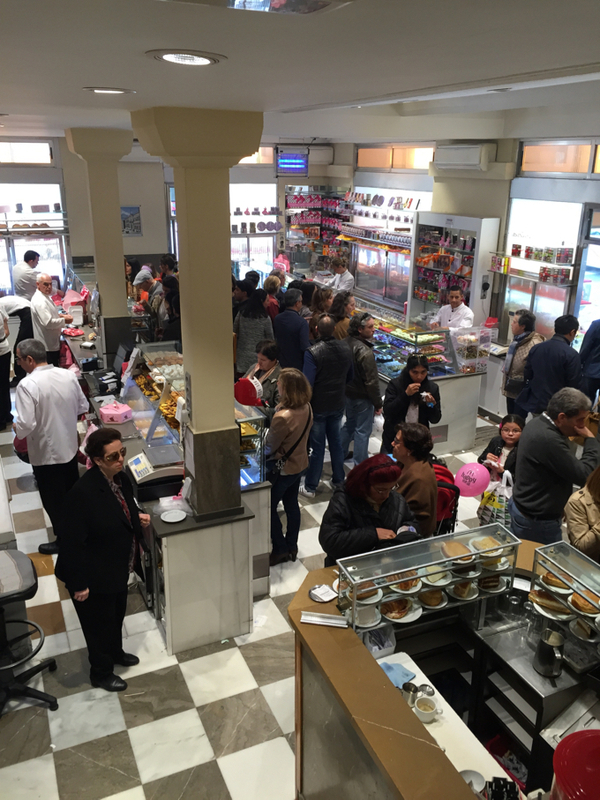 Alternatively slip out the archway onto Calle de Mayor and just before you arrive at Puerta del Sol stop for coffee and cake at the counter, or upstairs in the seated area at mind blowing La Mallorquina, an old style cake shop. 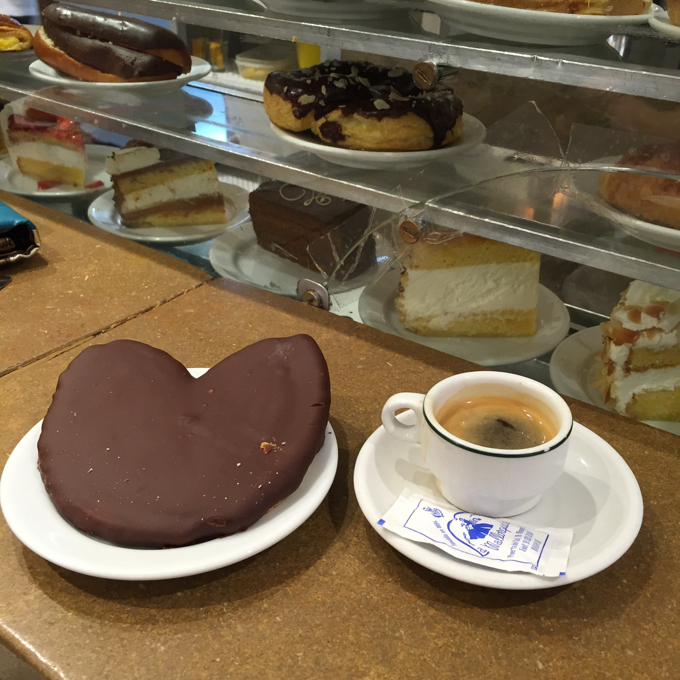 Do spend some time admiring Madrid’s baked goods. I also took some chocolate hedgehogs home for the kids. Re-caffeinated and sugared up, we were ready to do the tourist bit, smile at the numerous people dressed up as cartoon characters waiting to have a photo taken in Puerto Del Sol, take in the statues and have a photo next to the Bear and the Strawberry statue, the symbol for Madrid. Leaving Puerta del Sol, along Calle de Alcala we took in the sights: stunning architecture, chariots and angels look down at you from on high. There are incredible views from the observatory at Palacio de Cibeles which used to be the post office and is now a cultural centre. We arrived at siesta time, so check before visiting this one! 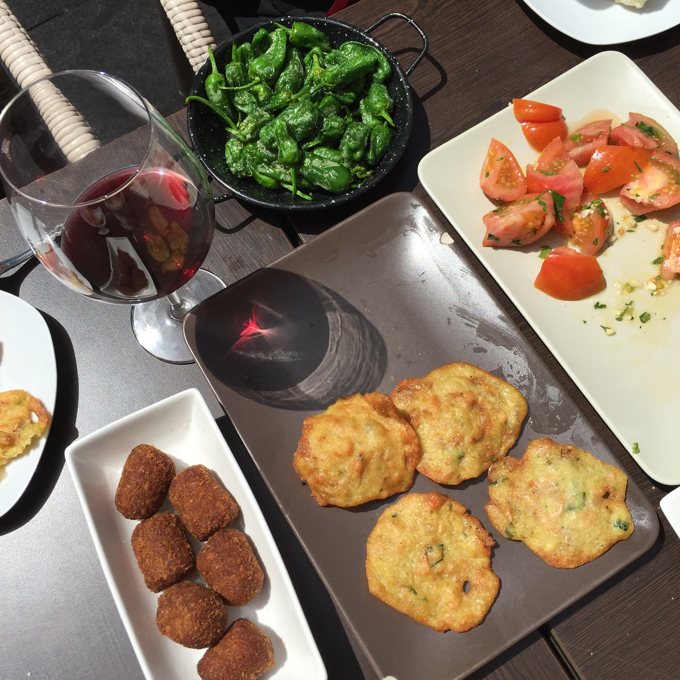 Instead we nipped down a side street to drink red wine and eat more tapas at Embroque. The mushroom fritters were delicious and the tomato salad so fresh and tasty. We didn’t go inside until the end of the meal, where the bullfighting memorabilia is in full, slightly disconcerting display. But it was the red chairs and blue tiles that caught my eye. In the old cinema Carlos III in Madrid’s Plaza de Colóncinema, this incredible gourmet food hall serves Mexican, Peruvian, Italian, and various Asian cuisine and is run by three chefs who have 6 Michelin stars between them, perfect if you all want to try something different but eat together. 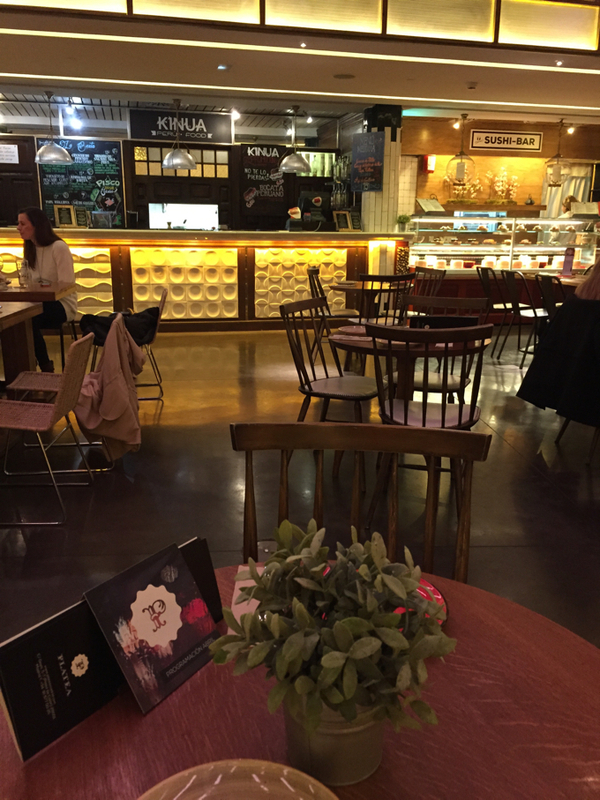 The Art Deco setting is stunning, it glitters and dazzles right down to the loos, plus the aim of the place is to bring top cuisine at fairly affordable prices. It’s so long since I’ve been to Madrid – one of my favourite cities in the world. 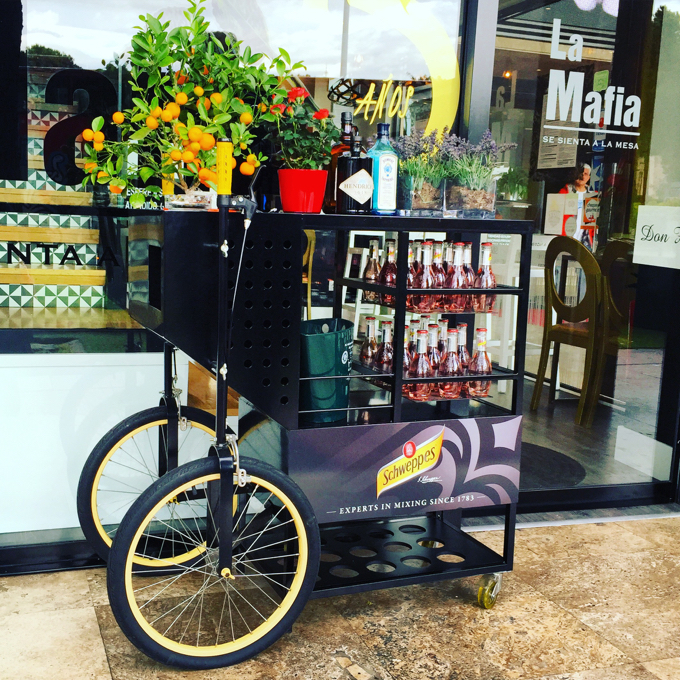 I would never have thought of drinking gin with tapas, but I can totally see why it works. 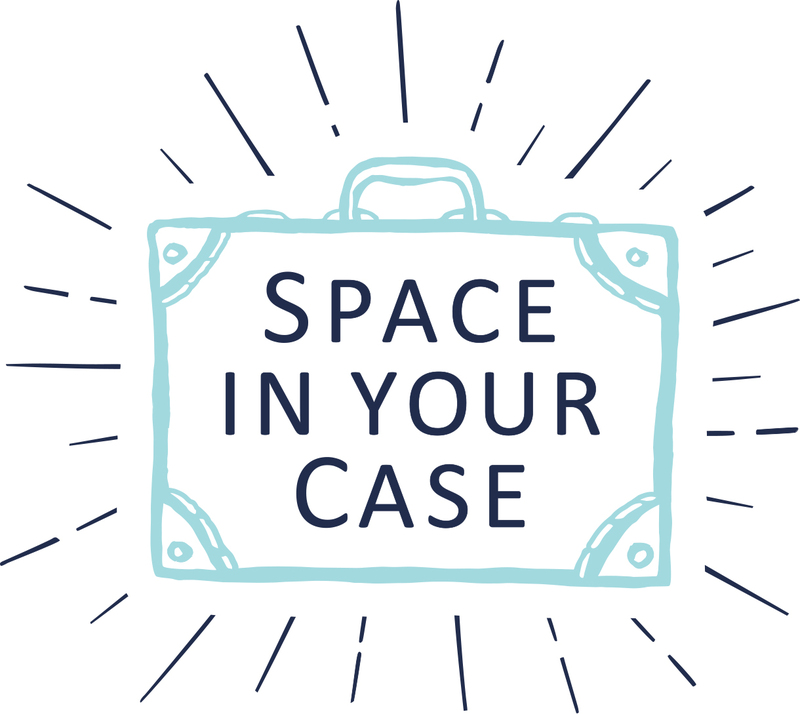 You’ve got me planning a city break now!